170 руб. 2-3 недели, 165 шт. 55 шт. 55 шт. 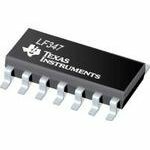 The LF347M/NOPB is a wide bandwidth high speed Quad JFET-input Operational Amplifier with an internally trimmed input offset voltage (BI-FET II technology). The device requires a low supply current and yet maintains a large gain bandwidth product and a fast slew rate. In addition, well matched high voltage JFET input device provides very low input bias and offset currents. This feature allows designers to immediately upgrade the overall performance of existing LF148 and LM124 designs. 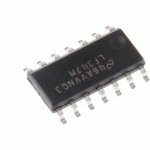 It is used in applications such as high speed integrators, fast D/A converters, sample-and-hold circuits and many other circuits requiring low input offset voltage, low input bias current, high input impedance, high slew rate and wide bandwidth. The device has low noise and offset voltage drift.